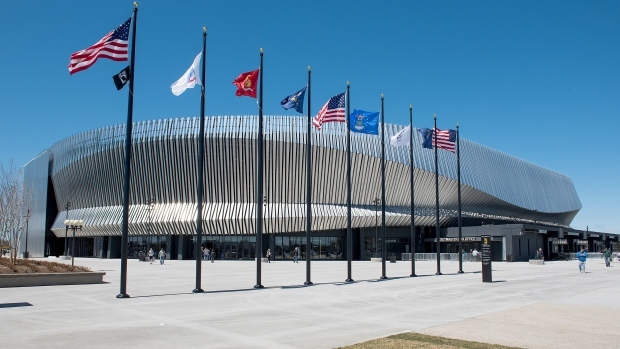 NEW YORK — The New York Islanders say that if they qualify for the playoffs they will play first-round games at Nassau Coliseum in Uniondale and any additional games at the Barclays Center in Brooklyn. The team and BSE Global, which operates both arenas, said Friday the decision was made in consultation with Gov. Andrew Cuomo's office. New York is in solid position to reach the playoffs, sitting atop the Metropolitan Division and in third place in the Eastern Conference. The Islanders moved to Barclays Center, the home of the NBA's Brooklyn Nets, in 2015 after 43 years at the Coliseum. They are splitting games between the two venues during the regular season, playing 21 at the Coliseum and 20 at Barclays. The arrangement is expected to remain in place until a new arena at Belmont Park, adjacent to the horse racing track, is ready for the 2021-22 season. Construction is slated to begin in May.